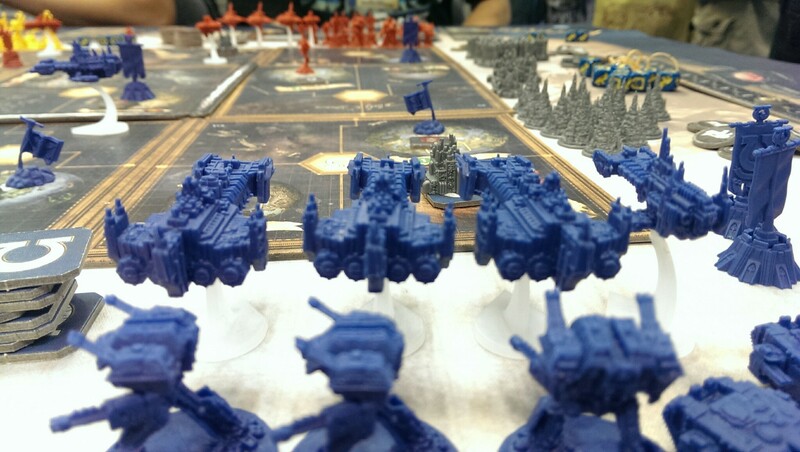 It just wouldn’t be Gen Con without Fantasy Flight Games unleashing another miniatures-packed game of conflict in the future. I hear that in the grim darkness of the far future, that’s all there is. The future is soooo cool! This massive behemoth of a game is already out in the wild, but at $100 it’s not something you just buy without trying. 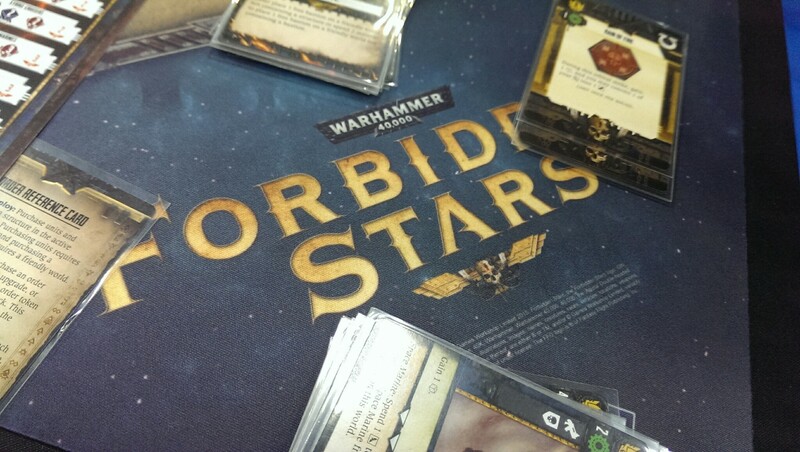 Sure, it’s got the minis, the combat, the custom dice, and space – everything Wolfie wants in a war-oriented board game, but that doesn’t mean it’s not a clunky mess. 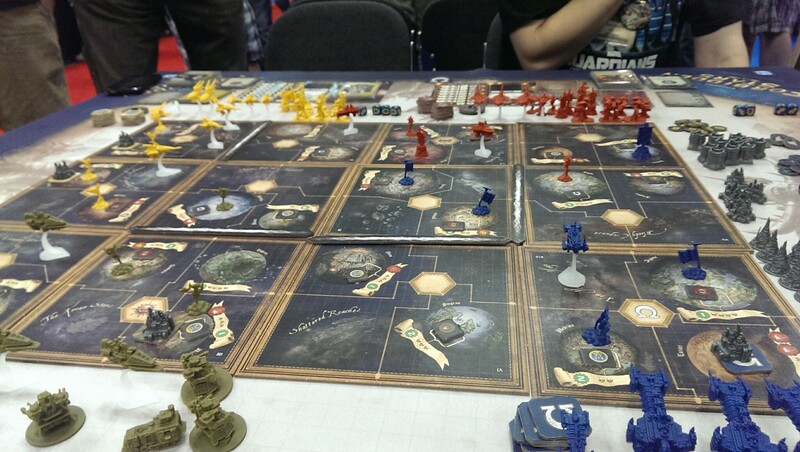 Well, I tried it out at Gen Con and I have to say, I rather enjoyed it. This is definitely on the to-buy list. Packed with exquisitely detailed starship miniatures and beautifully rendered tiles, this game is filled with neat rules and clever gameplay. Yeah, dice are involved in the combat, but you as a player have a lot of control over the outcome of each battle based on your long-term strategic decisions and your card play. Each round, players choose several “orders” tokens and place them on the tiles where those orders will happen – it’s sort of reminiscent of the Command Counter system from Twilight Imperium, which I love. In this case, however, the order token matches a specific action – so you can activate production in a system, and unit movement in another, and work on your technology in yet another. Order tokens stack up if there are multiple in the same system, even from different players. This adds a further level of strategy, because you can hem in a player’s action until you activate your own, possibly preventing them from bringing in reinforcements before your invasion fleet hits. Combat is resolved first by rolling dice, then three rounds of playing cards. Cards can modify dice, add additional symbols, and otherwise mess with the status quo. At the end of each combat round, guns deal damage that is negated by shields (these symbols are found on the dice and cards). These symbols stack up over the three rounds, so a savvy player can turn a desperate situation around with smart card play. If one side hasn’t been wiped by the end of the three rounds, the side with the most morale (which comes from surviving units, as well as dice and card rolls) wins the battle. The other neat thing is that each player is collecting objective tokens to win, but these tokens are spread around the map on different planets. Which means, the Chaos Marines aren’t necessarily going for the same planets as the Orcs. It can be to your advantage to hold an enemy objective, but it allows each player to stay in the game and have a chance of winning until the end. I really enjoyed this game, and while it’s no REX, it’s probably joining my collection sometime soon. Next Article GC ’15: Flick ‘em Up!